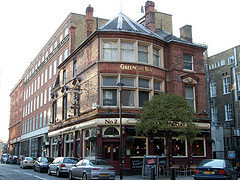 The LGBT Labour Annual General Meeting was reportedly turned away from a central London pub Saturday afternoon. The group of around 100 party activists had made a booking at the Greencoat Boy for a post AGM social, but were refused service. Accounts from those present, including a councillor, say that the manager told the organisers that he wouldn't have accepted the booking if they had known it was a gay group. The police were called and attended the pub and three LGBT labour members later gave statements at Charing Cross police station. Punch Taverns, the operator the the establishment, have promised a statement later today. Having taken issue with 100 social media enabled LGBT rights campaigners the topic was blogged and posted in minutes, trending on twitter within hours and by sundown Sarah Brown, Ed Balls and John Prescott, among others, had joined the condemnation.